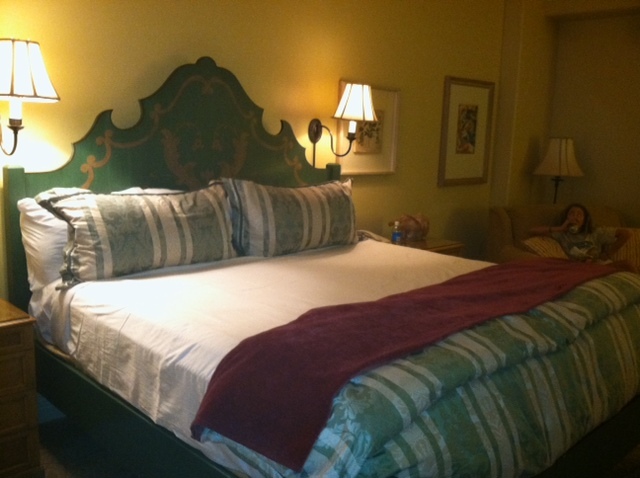 Chic Family Travels just got back from a spontaneous trip to Universal and we stayed at the Portofino Bay! Chic Family had a lovely week planned at the Bella Luna in Orange Beach, but the rain spoiled our plans 😦 It started to rain then it started to pour! Orange Beach was set to get a record amount of rainfall over the next few days and Chic Family Travels was totally bummed out. “What should we do? Hmmm??? 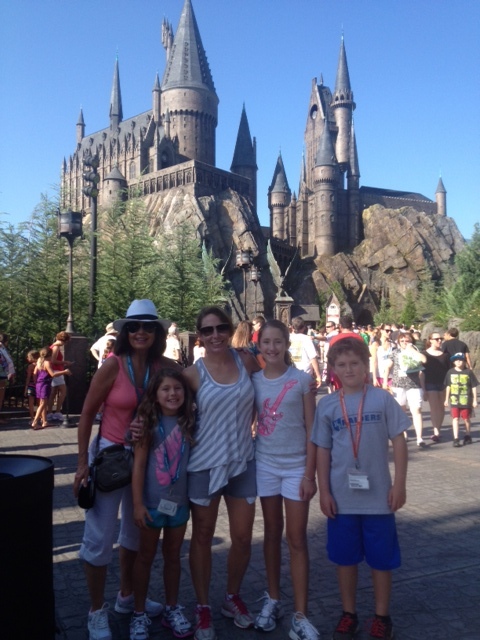 UNIVERSAL sounds fun!” We hopped a plane and off to Orlando we went! Since we had a mere 24 hours to plan our trip, we did not have the luxury of hand-picking our room and hotel. Truthfully, the Portofino Bay would not have been our first choice. We would have picked the Hard Rock but it was totally sold out. Fate was good thing because we ended up LOVING the Portofino Bay. The rooms were tasteful and roomy enough for a hotel room. We were on club level and I cannot say enough about the club. It was fantastic! I have stayed at Ritz Carlton’s that had less substantial food options. We were lucky enough to be located in the same building as the club lounge, making it very convenient to go back and forth. Make this request at your booking! Unlike the Hard Rock, the Portofino Bay does not have a “floor” where all of the club rooms are located so you could techincally be in a completely different building. The service at the Portofino Bay was also surprisingly fantastic. I was expecting a lot less to be honest. I thought that it was a theme park hotel and they “had us” because of the free fast passes and early entry to the park. I was sooooo wrong! At check in, they gave my youngest child a toy car. Very thoughtful and a hit for the two year old. He held that car the entire trip! Then the bellman gave us a tour and useful tips on how to get around the hotel. Two thumbs up to the Portofino Bay for service. This continued throughout our stay including at the pool area. More on that later. The Portofino was so beautiful at night when it was all lit up. Although I have never been to Italy, it really gave me the feeling that we were there! There were quaint outdoor coffee shops, wine bars and of course Sal’s pizza restaurant that I highly recommend. 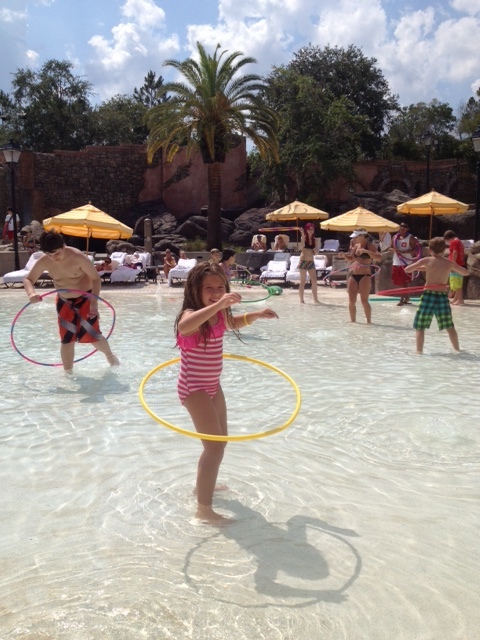 The beach pool at the Portofino Bay was a happening place during the day and we had a blast. It had a great waterslide that was actually quite fast! There was also a great kid pool with a ship for the little ones to climb on. It was fenced off from the big pool making it a great place for toddlers. The lifegaurds at the Portofino Bay doubled as entertainment directors during the day. They had everything from limbo contests to Hula Hoop contests throughout the day. They also had great pool service that was quick and friendly. We LOVED the cold towels they passed out in the middle of the day as well. Now that is service my friends! 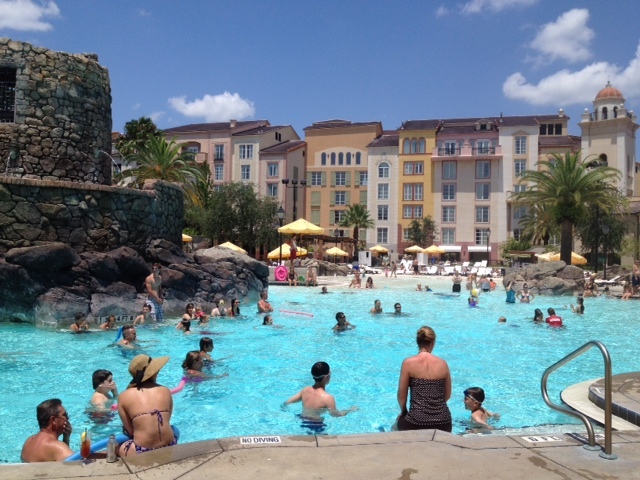 The music at the Portofino Bay by the pool was soothing and not too loud. This is what set it apart from the Hard Rock in my opinion. The Hard Rock’s music was that “Thumping” music that does not exactly scream take a nap by the pool if you know what I mean. I thought that the Portofino did a great job of mixing fun and relaxation while the Hard Rock is just all about fun, loud, and rocking out. It felt more like a “night club” than a pool to me. The only thing I was disappointed in at the Portofino is that they close their pool at 8pm while the Hard Rock stays open much later. 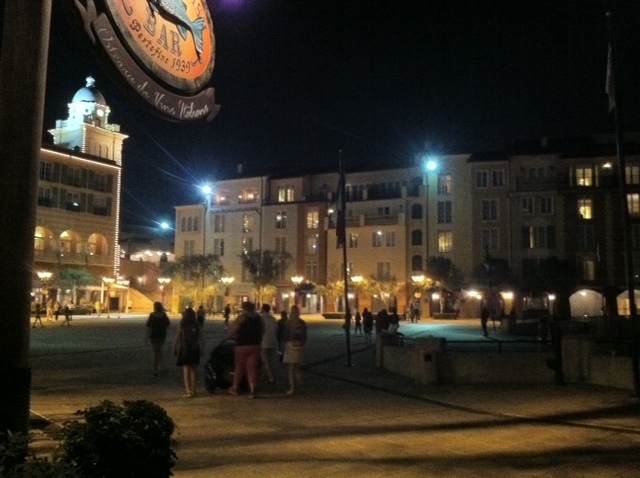 The Portofino Bay was the furthest from the parks, but it did not bother us because we like to walk. Also, they have water taxis and bike buggies that we used several times. We loved the fast passes and early entry to parks that is a bonus for staying at a Universal hotel. We got to ride Harry Potter with less than a 20 minute wait! The Hulk, our favorite ride, was never more than a 15 minute wait! Overall we LOVED the Portofino Bay at Universal in Orlando and were pleasantly surprised at the level of service and amenities it offered. Chic Family Travels had a great trip to Universal and was ready to head back to Orange Beach Alabama to enjoy the beach and sun, FINALLY! ← Buccament Bay in St Vincents is winning the race! As the grandmother to 4 traveling,I had a ball. My daughter described the hotel correctly. I enjoyed the Music della Notte( music of the night) each night on the picturesque Harbor Plaza( lighted balcony of the portofino) This was live opera and tunes like ” Fly me to the moon” . 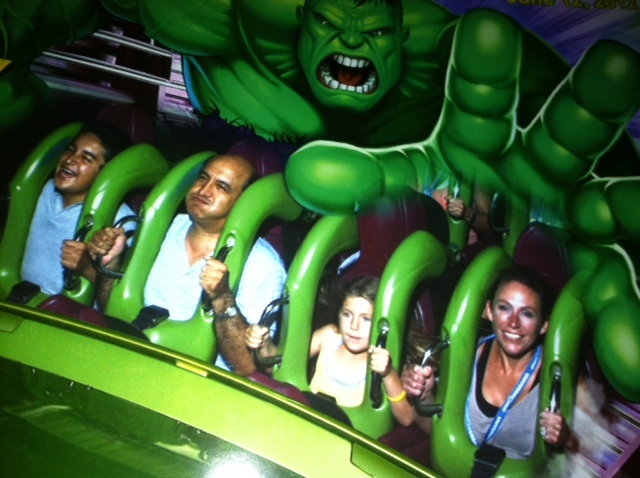 BTW, I rode the HULK also.